The sleepy fishing village of Larantuka was originally settled by the Portuguese, who came to Flores in the 15th century and initially settled both here and in Sikka. The Portuguese influence has waned in the intervening years, but the Larantukanese and their capital retain a bit of Iberian flavour, from the pink and spire-festooned Portuguese-influenced cathedral to their candlelit Catholic graveyards. Some Portuguese words and sayings remain in the local patois, and many people have mixed Portuguese-Florinese ancestry. 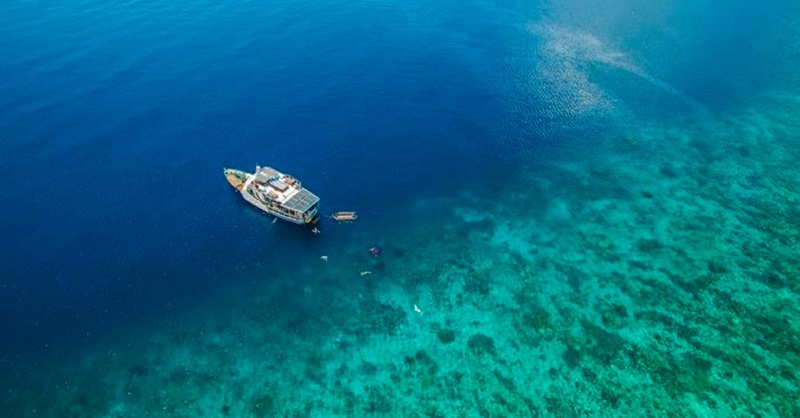 At the very tip of eastern Flores and nestled somewhat disquietingly beneath Ile Mandiri, Larantuka is far off the tourist map and retains a green, cool maritime flavour distinctly unlike the far more popular Labuan Bajo. Most of the hotels in Larantuka were built for the hordes of visitors that come for the famous Good Friday procession, where the entire town turns out in finery to celebrate the revival of Christ. Many of the related celebrations are organised by the Konfreria Renha Rosario, the "Brotherhood of the Queen of the Rosary," who venerate an image of the Virgin Mary said to have either been plucked from the sea or washed ashore in the area many years ago. Shrouded bearers carry a coffin of Christ through the streets in a close cousin of a Portuguese religious tradition, moving from altar to altar through the city. A number of other Catholic celebrations take place during Holy Week, including a women’s celebration known as the Mama Muji. This would be a remarkable spectacle to witness, but make sure to book hotels far in advance. Religiously-minded travellers and those simply interested in culture may want to attend a Sunday service at the cathedral if they’re in town. Travellers can also investigate some little-visited traditional villages, snorkel, and even do some adventurous scuba diving. From Larantuka, it’s reasonably easy to make connections by air and by sea to the nearby Solor and Alor islands, as well as to Kupang in West Timor. We had a good experience with Ile Mandiri Tour and Travel, run by Englishman Chris and his wife, Maria. The duo are a great source for esoteric and fascinating information about Larantuka, and can help you put together a daytrip or two. They also run snorkelling and boat trips to surrounding areas, and are happy to answer your questions. Chris is hoping to open up a museum in Larantuka, and he has a fascinating small collection of local artifacts. He can tell you where to go if you’re deadset on checking out some Portuguese cannon. Call (0821) 6999 5348 or (0383) 2325746, or contact http://www.ilemandiritourandtravel.com/. Their address is Jl Bawah Kel. Sarotari Timur. RT/RW : 03/01, Larantuka. For a day tour of the area, we went with Evi, an excellent female guide who speaks great English and takes a deep interest in the traditional lifestyles of the area around Larantuka. She can be hired for the day for 250,000 rupiah, and is happy to take around single customers on the back of her motorbike. Cars can be arranged for bigger groups. Just tell her what you’re interested in seeing. Contact Evi at T: (0812) 3700 0571. Last updated on 9th July, 2017. Browse our independent reviews of places to stay in and around Larantuka. Check out our listings of things to do in and around Larantuka. Read up on how to get to Larantuka. Planning on riding a scooter in Larantuka? Please read this. Use the above map to find specific destinations in and around Larantuka which are listed on Travelfish. Bed icons indicate a guesthouse, hostel or hotel, the knife and fork is an eatery or bar and the four-way circular thingy marks sights, attractions and other points of interest. Click on any icon for a short pop-up and a direct link to the page for that spot. If you are in the area, use the teardrop icon near the top left to show your position on the map (you'll need to allow position sharing for this last feature to work).